AURORA — The Aurora Pride Festival is looking for sponsors as planning gears up for its 2019 set of events, scheduled for June 7 through June 9. Sponsorships for the 2019 Aurora Pride Parade range from $150 to $5,000+ with sponsor perks such as featured logos on select marketing materials, advertisements across social media, banners along the Pride Parade route, and even named sponsorship of one of the six major events during this family-friendly weekend. For more information on the sponsorship levels and how to become a sponsor the 2019 Aurora Pride Festival, visit https://www.aurorapride.org/become-a-sponsor/. All sponsorship payments are due by May 1, 2019. If you are not looking to sponsor the 2019 Aurora Pride Festival but are interested in donating, a GoFundMe page will be available to accept payments later this week with more information being shared across Aurora Pride’s website, Facebook page, Facebook group and Twitter account. Sponsor the Aurora 2019 Pride Festival! We are looking for sponsors for the 2019 Aurora Pride Festival! As you've heard, the 2019 Pride Festival is going to be bigger and better than ever with events such as a Rainbow Run 5K, Pride Marketplace, Opening and Closing events, and of course, the Indivisible Aurora Pride Parade! For more information and a downloadable form, see below, or visit https://www.aurorapride.org/become-a-sponsor/! Not looking to sponsor but you're interested in donating to this amazing cause? A GoFundMe page will be available to accept donations later this week. Stay tuned! Thank you so much to all of our prior and future sponsors of Aurora Pride! We couldn't do this without you! CHICAGO — On Saturday, October 27th, Human Rights Campaign Chicago held their annual gala and auction at the Chicago Marriott in Downtown Chicago. Despite the masquerade theme of the night, there was no hiding the joy of the guests, volunteers, and staff that attended the event. According to the HRC Chicago website, this annual gala and auction celebrates the great strides made for LGBTQ equality across the nation, including honoring local leadership excellence. This year, Indivisible Aurora, a community advocacy group based out of Aurora, Illinois, was recognized for their outstanding effort in bringing the first-ever Pride Parade to the Chicago suburbs with the “Community Equality Award.” Gwyn Ciesla, Co-Chair of Aurora’s Inaugural Pride Parade and Director of LGBTQ and Alliance with Indivisible Aurora, accepted the award. Gwyn Ciesla, accepting the “Community Equality Award” from Human Rights Campaign Chicago. The idea of hosting Aurora’s Inaugural Pride Parade came in June 2017 as the nation approached the anniversary of the Pulse nightclub massacre. It was Ciesla’s wife, Elisa, who suggested it was time to bring Pride to Aurora. The parade efforts weren’t met without resistance, however. There were members of the community who sought to block the approval of the Pride Parade application, and on the day of the Parade, marchers were met with protesters, but only a few. “People of all ages, sexual and gender identities, faiths and walks of life came, and we had a BLAST. We sang, we danced, we laughed. There were some tears, too,” said Ciesla. So what’s next for the LGBTQ+ community of Aurora? The date of Aurora’s second annual Pride Parade has been set for Sunday, June 9, 2019. In addition, the Aurora Pride Parade has expanded into the Aurora Pride Festival which will include activities all weekend long including a speaker series, marketplace, 5K, and more. For more information on the 2019 Aurora Pride Festival, visit AuroraPride.org. Looking to make a difference and want to get involved with the 2019 Aurora Pride Festival? On Saturday, October 13th, Indivisible Aurora and the Aurora Pride Festival planning committee will be holding a Volunteer Fair! Come and learn how you can help! We need help with a variety of events and in many different ways! We can’t have an amazing event without the help of our wonderful and dedicated volunteers! AURORA — Aurora Pride Festival, the Pride celebration in Illinois’s second largest city, announced today that an entry from Alisa Kober of Arlington Heights as their logo for 2019. Indivisible Aurora announced the contest in mid-July. Alisa came out ahead of 20 semi-finalists. Among the prizes she wins are a $300 cash prize, t-shirt and a spot in the VIP section at Pride in 2019. The festival is produced by volunteers and will being going into it’s second year in 2019. The response for the contest was huge. The pride festival, like others that have started up outside of Chicago, focuses on being child and family friendly. Congratulations to Alisa Kober, Aurora Pride Festival 2019 Logo Winner! Congratulations to Alisa Kober of Arlington Heights! It was Alisa's "Paint the Town" submission that inspired the Aurora Pride Festival 2019 logo! Thank you so much to Alisa and everyone who submitted outstanding logos for this year. Your support and dedication as we head into our second annual Pride Parade and first ever Pride Festival is truly appreciated! CALLING ALL STUDENTS, ARTISTS, AND INSPIRED COMMUNITY MEMBERS! Indivisible Aurora is looking for a brand-new logo and visual identity for the expanded 2019 Aurora Pride Festival and we need your awesome talents. The logo needs to be unique and help promote the Aurora Pride Festival's goal of, "Promoting the inclusion and support of LGBTQ+ Aurorans through art, entertainment, and conversation." The Contest is open only to individuals. The Contest is not open to companies, educational institutions, organizations, etc. or to groups associated with such institutions. Got that? Members of Indivisible Aurora, the contest judges and their immediate family are not eligible to enter the Contest. It's only fair! Entrants must be of sufficient legal age and standing to enter into a contract with Indivisible Aurora as required below. No babies. The entries must be submitted as a scalable vector graphic with a transparent background in either .EPS or .PDF format. See the Submission Guidelines below for further information. No more than 3 Entries may be submitted by any one Entrant, and each entry should be submitted separately. The deadline for Entries is midnight on August 1, 2018, Central Daylight Time. The purpose of the contest is to design a logo for the 2019 Aurora Pride Festival. The logo will be used online, in print, on merchandise. Flexibility is a key requirement, including the need to resize easily and to look good in black and white as well as color. The final version of the logo will need to be suitable for high quality printing. Entrants should take care to ensure that their Entries are not in any way similar to existing logos or other copyrighted images. A logo that infringes on an existing logo or contains copyrighted elements, no matter how well crafted, cannot win the Contest. The logo cannot be a variant of the City of Aurora "A" mark. No logo will be accepted that contains or emulates the design elements of the City of Aurora's logo. The logo must present equally well against light and dark backgrounds. The logo must meet community standards (i.e., vulgarity is not allowed and will be dismissed as trolling). The limit on attachment sizes for our email is 5Mb. Please compress image accordingly. To recap, entry will consist of the logo with a transparent background in .EPS or .PDF format. We are able to handle most common file compression formats. Subject to the requirements outlined above, the winning design will be announced on Indivisible Aurora's social media platforms on or around August 10, 2018. A complimentary logo T-Shirt. Cool! The right to use the logo in their works portfolio and to identify him/herself as the logo designer. The winning design will be selected by judges appointed for the purpose and by Indivisible Aurora. Their decision will be final. No further correspondence shall be entered into. Indivisible Aurora reserves the right not to select a winner if, in its sole discretion, no suitable entries are received. Additionally, Indivisible Aurora may request of the winner alterations and modifications of the winning logo as it deems necessary. Indivisible Aurora reserves the right to disqualify any Entrant or Entry at its sole discretion. No correspondence shall be entered into. The winner will be required to sign a contract assigning all ownership of the logo to Indivisible Aurora. Accepting the prize constitutes permission for Indivisible Aurora to make public and otherwise use winner’s name, and city of residence for publicity purposes. Further personal data may be requested but is not required. All Entries will become the sole property of Indivisible Aurora and may be displayed publicly on Indivisible Aurora web sites. The winning entry will be registered by Indivisible Aurora as a Service Mark and the Entrant agrees to transfer all right and title to the Entry to Indivisible Aurora in accordance with the Official Rules of this Contest. Participation constitutes the Entrant’s full and unconditional agreement to and acceptance of these Official Rules. By participating in the Contest, the Entrant is representing and warranting that he/she has read and understood, and agrees to be bound by, these rules. Including the guides and rules referred to herein, these Official Rules constitute the entire agreement between the Entrant and Indivisible Aurora in relation to the Contest. They govern the Entrant’s participation and supersede any prior or other agreements between the Entrant and Indivisible Aurora and relating to the Contest. The success of Aurora's inaugural gay pride parade last month has convinced organizers to try something even bigger next year: a three-day Aurora Pride Festival that would include a 5K race, art exhibition and poetry slam along with a speaker series, small-venue performances and an even bigger parade. Chuck Adams, the executive director of Indivisible Aurora and the driving force behind this year's parade, said organizers always hoped to turn the event into a weekend-long celebration, but first wanted to prove that a family friendly parade could be a success in the Western suburbs. "We thought maybe we should be a little less ambitious and nail the parade part of it first" before pitching the idea of a three-day fest, he said. With their success, organizers now have submitted a letter to the city asking to hold a parade again on Sunday, June 9, 2019, and to include the other activities on the Friday and Saturday leading up to it. The proposal still must be approved by the city council, but Mayor Richard Irvin already has endorsed it. The parade, Irvin said in a written statement, brought "new levels of unity, energy and pride to Aurora. It was well organized, fun and family-friendly. All along the parade route, I spoke with people -- some with tears in their eyes -- who repeatedly thanked us for being the host city." Adams said organizers were confident in their ability to pull off the inaugural parade, but even they were surprised by how most of the community embraced the idea. "The explosion of love and acceptance was really very personal and emotional," he said Monday. "It's the unity and vibe of love and positive outpouring of acceptance that we hope to expand on." If they get council approval, Adams said the key change next year will be a kickoff event on Friday evening where organizers will talk about the agenda for the weekend, introduce the parade Grand Marshal and have a keynote speaker serve as a "primer to get everything going." The parade would serve as the grand finale on Sunday. As with this year's parade, he said, the event would maintain a family-friendly air. "This isn't Chicago," Adams said of Aurora. "It doesn't have Chicago's brash." Adams says he was encouraged by the number of youngsters he saw waving rainbow flags at the parade and by the participation of 11 churches and a synagogue. Organizers are hoping to get sponsors for many of next year's events to provide both money and volunteers for some of the events. Not everyone embraced the parade, Adams says, but the vast majority of the feedback his team received was positive. "We really embraced the community," he said, "in a way it hasn't been done before." Organizers of the Aurora Pride Parade have submitted a letter of intent to expand the parade into a weekend-long festival for 2019. Indivisible Aurora has submitted to have another parade on Sunday, June 9, 2019. In addition, the letter of intent proposes expanding the event into a weekend-long Aurora Pride Festival with the parade on Sunday, a kick-off event on the evening of Friday, June 7, and a full day of activities on Saturday, June 8, including a 5K race, a vendor market, an art exhibition, a poetry slam, a speaker series and a film festival. The proposal has received the endorsement of Aurora Mayor Richard Irvin. The city even announced the intent of Indivisible Aurora in a city news release this week. According to the release, the letter of intent is an administrative procedural step in the city's event planning process. After a complete application is submitted, it must be approved by the City Council. 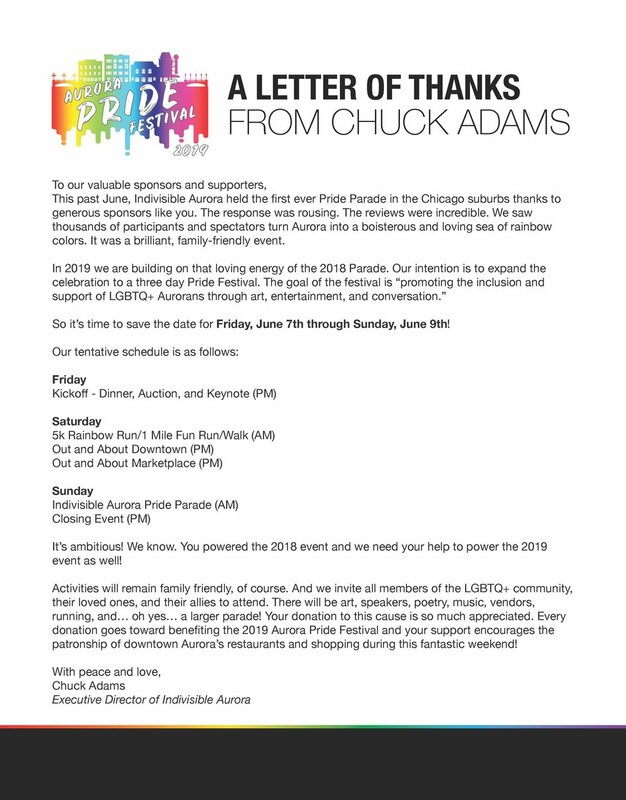 AURORA, IL - This week, organizers of the inaugural Aurora Pride Parade submitted a Letter of Intent to the City of Aurora requesting to hold the next Aurora Pride Parade on Sunday, June 9, 2019. In addition, the Letter of Intent proposes expanding the celebration into a weekend-long Aurora Pride Festival with the parade on Sunday, a kick-off event on the evening of Friday, June 7 and a full-day of activities on Saturday, June 8, including a 5K race, vendor market, art exhibition, poetry slam, speaker series and film festival. The proposal has received the endorsement of Mayor Richard C. Irvin. The Letter of Intent is an administrative procedural step in the City's event planning process. After a complete application is submitted, it must be approved by the Aurora City Council.